“You don’t have to cook fancy or complicated masterpieces – just good food from fresh ingredients.” – Julia Child. Celebrating Julia Child’s would-be 104th birthday on August 15th! Today we celebrate ‘Raksha bandhan’ – A festival to celebrate the love and the lifetime bond of sisters and brothers. Sister ties a decorative thread on her brother’s wrist for his well being and in turn the brother promises to protect her for lifetime! Sweet isn’t it? How about the special dessert we enjoy on this day? 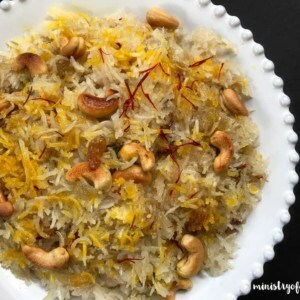 My all-time favorite ‘Narali bhath ‘- Sweet coconut rice cooked with aromatic cardamom, cloves, raisins and then garnished with saffron and lightly fried cashews! Absolutely delicious and simple recipe that I make throughout the year. You can use freshly grated coconut or the frozen fresh coconut that is available in most grocery stores. 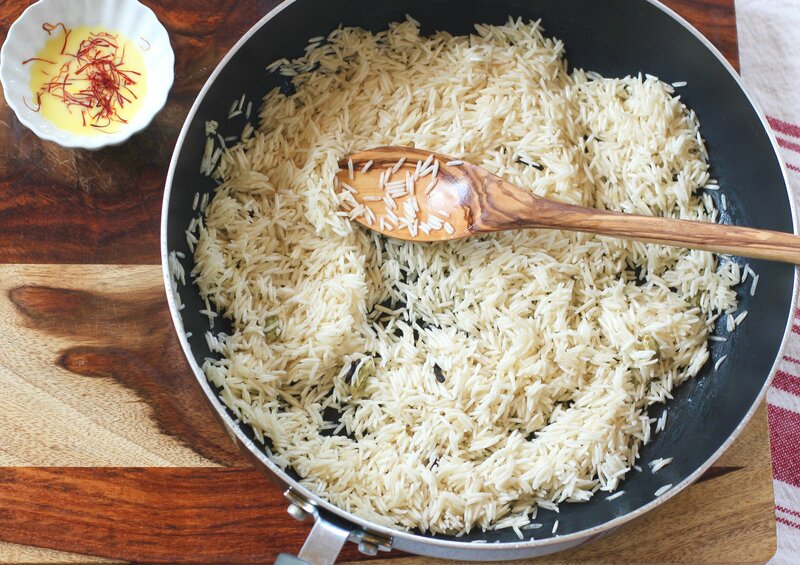 Any kind of rice works but I like to use the long-grained, aromatic Indian Basmati rice. Few other basic ingredients used in this recipe – cardamom, cloves, a little bit of ghee, raisins, saffron, sugar and cashews(optional). 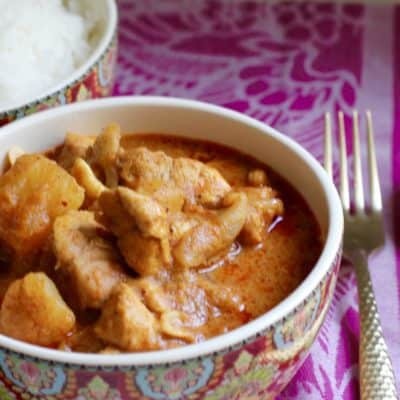 This recipe is a traditional Maharashtrian recipe and also one of my mom’s signature dish that was passed down to her by her mother. 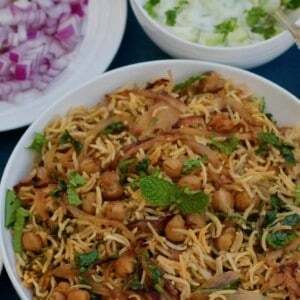 Every time I make this dish it stirs up the nostalgic memories of my childhood! Add the saffron to warm milk and keep aside. Toast the cashews in a pan or stir-fry them in 1 tsp of ghee. Keep them aside for garnishing. Rinse and drain the rice. Heat a medium pot and add ghee to it. Add cloves and cardamom and fry them for a minute on medium heat. Add the rice to the pot and stir it gently with the cloves and cardamom for 2 mins. Add salt and water. Bring it to a boil on medium-high heat. Turn the heat on simmer and cover the pot. Let the rice cook for 10 minutes. At this time the rice will be fully cooked. Gently pour the rice in a wide platter and let it cool down for 5 mins. 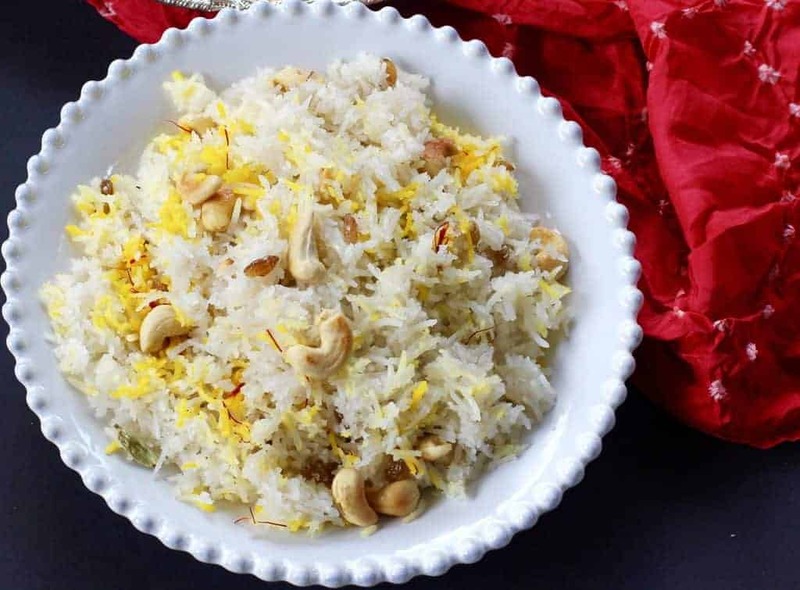 Take a spoonful of rice and gently mix it with the saffron soaked in milk. Keep aside for garnishing. 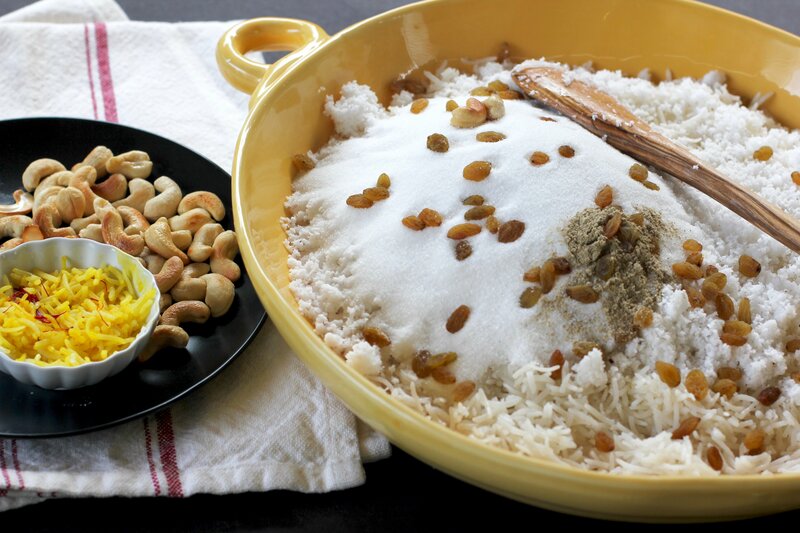 Mix the cooked rice with sugar, grated coconut, cardamom powder and raisins. Put it back in the pan the was used to cook the rice. Put a lid on the pan and cook on lowest heat for 30 mins. 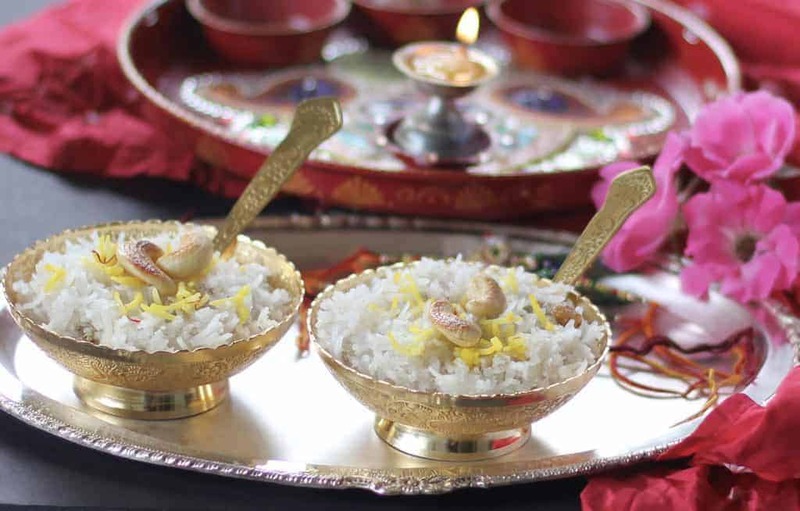 Garnish with the cashews and rice mixed with saffron. Can be served hot or at room temperature. 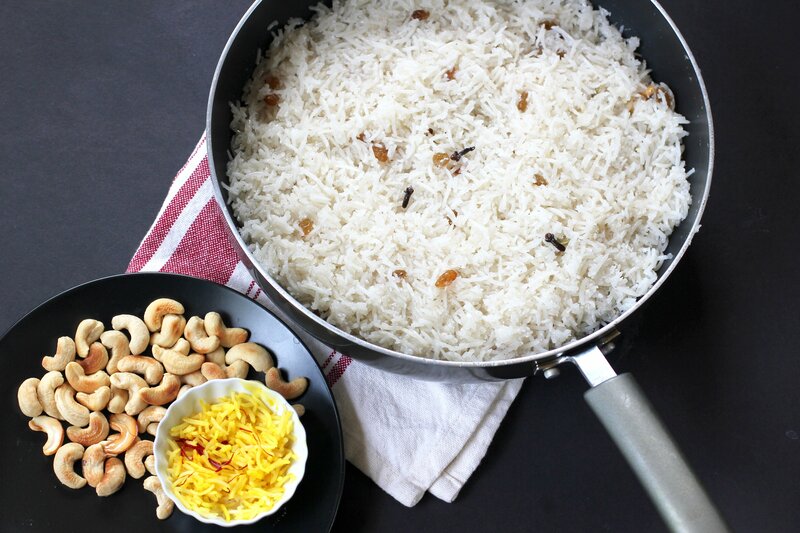 Sweet coconut rice cooked with aromatic cardamom, cloves, raisins and then garnished with saffron and lightly fried cashews. Add the saffron to warm milk and keep aside. Toast the cashews in a pan or stir-fry them in 1 tsp of ghee. Keep them aside for garnishing. Rinse and drain the rice. Heat a medium pot and add ghee to it. Add cloves and cardamom and fry them for a minute on medium heat. Add the rice to the pot and stir it gently with the cloves and cardamom for 2 mins. 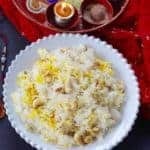 Take a spoonful of rice and gently mix it with the saffron soaked in milk. 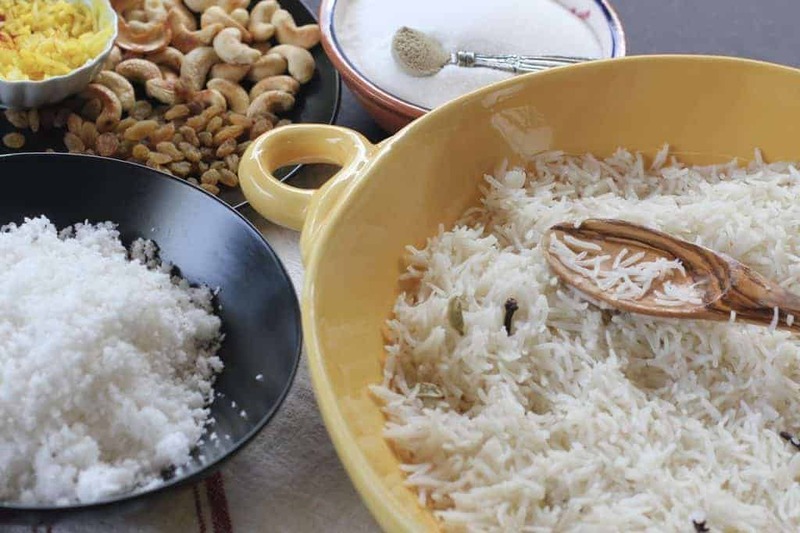 Mix the cooked rice with sugar, grated coconut, cardamom powder and raisins. Put it back in the pan the was used to cook the rice. Put a lid on the pan and cook on lowest heat for 30 mins. 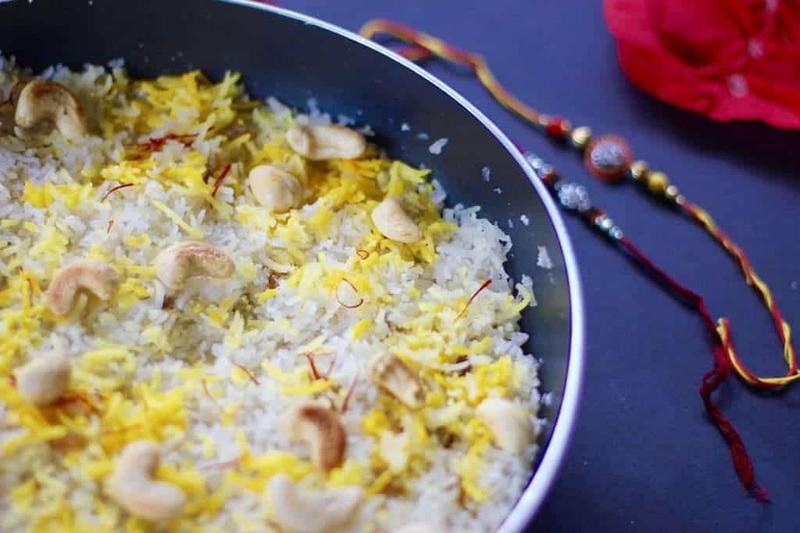 Garnish with the cashews and rice mixed with saffron. Serve hot or at room temperature. Mast aahe…..in case you don’t understand my Marathi…. It’s very nice….. Looks beautiful…. 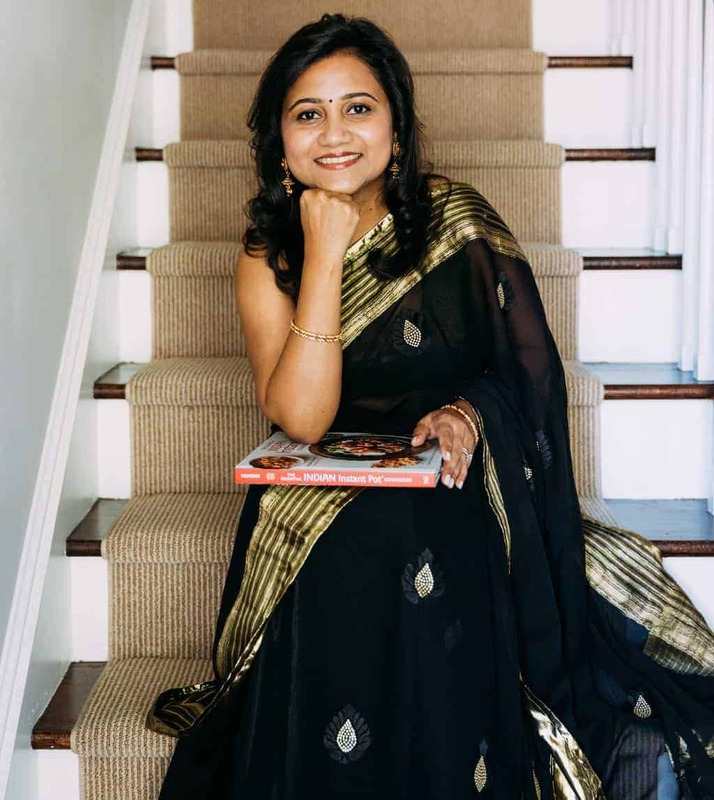 Thank you aani Marathi samajale mala! 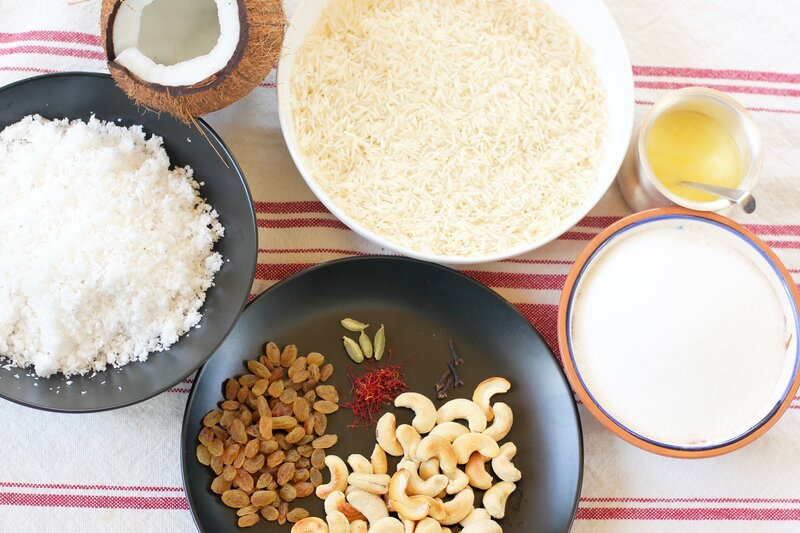 I love coconut rice and can’t wait to try it with saffron. Your photos turned out beautiful! Thank you! Please let me know how you like it. Just yesterday I had this at a friend’s place for raksha bandhan. Nice recipe? Archana we make rice with sugar crystals or the fine sugar but it’s mostly mashed up. Yours looks yumm. ?? Thank you! 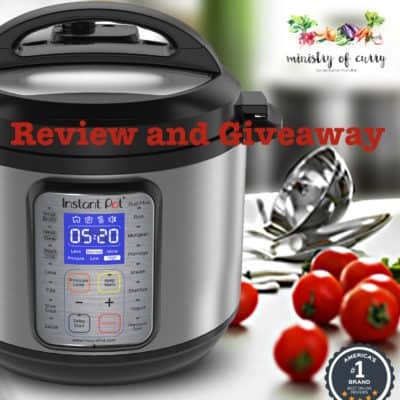 I would love to learn your recipe too! 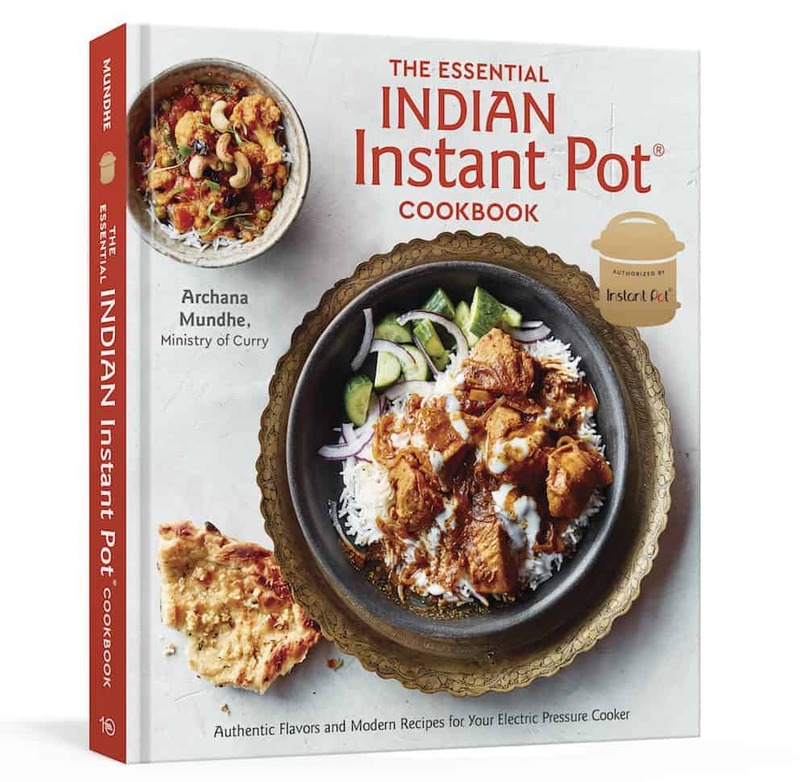 Hi Archna…I simply loved most of your recipes(I could see only partial of the long list) and their manner of presentation! They are so tempting!! Thank you for your kind words Swati! I look forward to trying your amazing recipes too! Avocado truffles look so good. You had me at sweet ? This looks both fabulous and festive !!! The saffron rice is beautiful in this.. And all the ingredients are ones that my taste buds do cartwheels over ? Thank you Pan for your kind words! This is a simple no-fail recipe with few ingredients that everyone loves! And perfect for tiny kitchen cooking ? Tiny Kitchen Approved seal ? Yes, this one approves for tiny kitchen!! Thank you for reblogging, Pan! By the way, my sister reblogged it on our site before I could get to it.. Thanks goes to her ? Lovely recipe. I adore saffron and am always looking for new recipes for it. Thank you for sharing! Want you to know I picked up saffron this morning but forgot the coconut ? Hopefully I get a chance to get back to a grocery soon..
Yay! 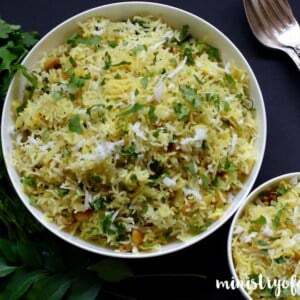 So look for frozen grated coconut, much easier to use. readily available in indian stores. Thanks ! I’ll post a pic in the reblog of your post when I do ? New recipe for me! Thanks.